So I’m trying to get more creative with my salads. And this is definitely going to be filed under filling, delicious, interesting salads. This is a great summer salad, full of fresh, strong flavors. 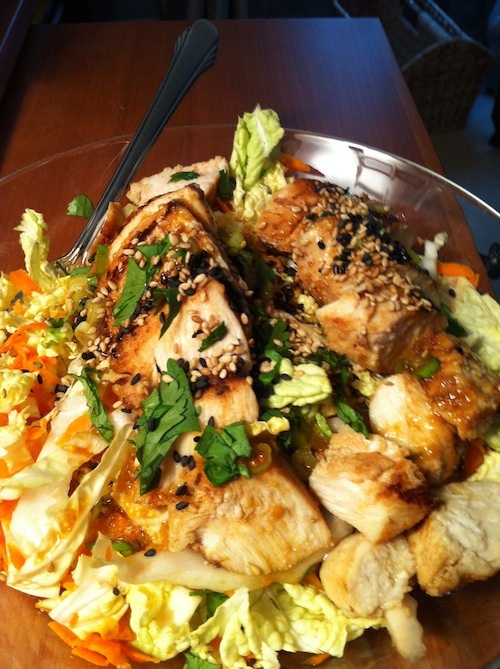 The marinade is wonderful on the chicken, and then it’s very easily transformed into a dressing for the salad. If you’re looking for a new, interesting salad, you’ll definitely want to give this one try. I made this on a grill pan, but it’ll be great for outdoor summer barbecues too! In a measuring cup, whisk together the soy sauce, canola oil, ginger, hoisin sauce, sesame oil, sriracha, and salt. Add the chicken to a large ziploc bag, then add in 3 Tbsp of the marinade. Seal the bag and allow to marinade for at least 30 minutes. Add red wine vinegar and scallions to the remaining marinade and set aside. While the chicken is marinating, prepare the salad ingredients, and toss together in a large bowl. Grill the chicken for about 4-5 minutes on each side, until cooked through. Slice the chicken, and place on top of the salad. Dress the salad, and serve.